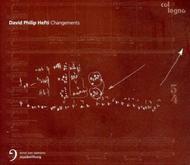 David Philip Hefti, born in 1975, studied under Rudolf Kelterborn and Wolfgang Rihm, amongst others. As a composer of orchestral and chamber music he specifically seeks contact with the classical concert hall and has certainly made a name for himself as both a conductor and composer. Hefti�s music, which does not shy away from external references or from the stimulation of tradition, bears witness to a structurally shrewd compositional imagination that is equally attentive to timbre.